Feel free to Wipeout with these ballpoint pens, made to look like a set of real drumsticks. These rhythmic writing utensils are made for those who march to the beat of their own drum -- even if they're far from their drum set! 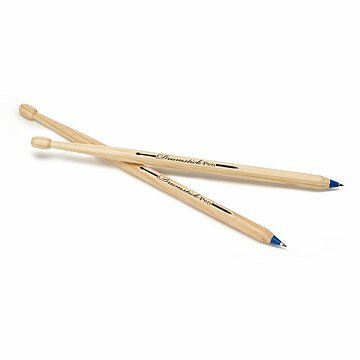 Both perpetual tappers and proficient percussionists will be charmed by this pair of striking ballpoint pens that resemble a set of real drumsticks. Perfect for maintaining an air of productivity in the classroom or office while pantomiming your favorite drum solo on the sly. Blue ink. Sold in set of 2. Made out of poplar wood in China. Fun gift for my "drummer boy"
A very fun birthday gift for my husband...made the "drummer boy" in him very happy! Need a gift for a Drummer? My son gives drum lessons, and he needs to write things down for his students, and this will be perfect for that. This was a gift for someone who likes music. The product was exactly as advertised, so I am extremely pleased. Now when our son comes home for the holidays, he can use this to 'drum' and write! I think this is a unique idea which will likely be enjoyed while my grandson is making up songs. Does not write! Embarrassed to have given as gift! Embarrassed to have given this as a gift. Wasn't cheap either with shipping. Will think twice before ordering from this site again. These were a gift for a friend who is a drummer. Will be a perfect gift for the recipient! Functional as pens, and maybe even some desktop drumming!